Valentine's Day! The Love for Red, Pink, Burgundy & Chic Part I! Valentine's Day, the day of love & friendship! And for those of us who love style and fashion, it's a day to dress up in those reds, pinks, and burgundy! Here are some chic ideas with red! Later during the week, I will post for you all ideas with the non-traditional red colors! Hope you all love these as much as I did doing them!Look No. 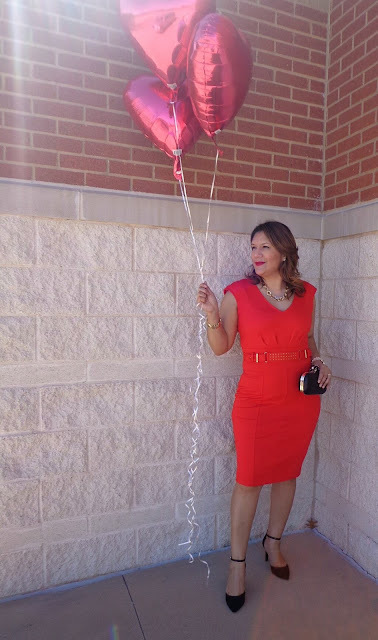 1 Jennifer Lopez red Pencil Dress (my yes2you gift from JLO and Kohls) Jennifer Lopez statement necklace (yes2you gift from JLO and Kohls) Black ankle strap heels (old purchase from Ross Dress for Less)!Look No. 2 Marc Andrew New York lace dress, Cosmopolitan gold heels, Victoria Secret gold sequin clutch, and statement necklace were all resale shop finds!Look No. 3 Worthington top 9.99(red zone clearance from JcPenney) Black Label pencil skirt (old purchase at JcPenney) Ana leopard print heels (purchased few months ago at JcPenney)! Forever21 black pumps (old purchase from resale shop)! Betsey Johnson black tote under $30 at DD'S Discount Store! Even though we don't have much left for the winter season, I have scored some great deals on winter coats for the family! 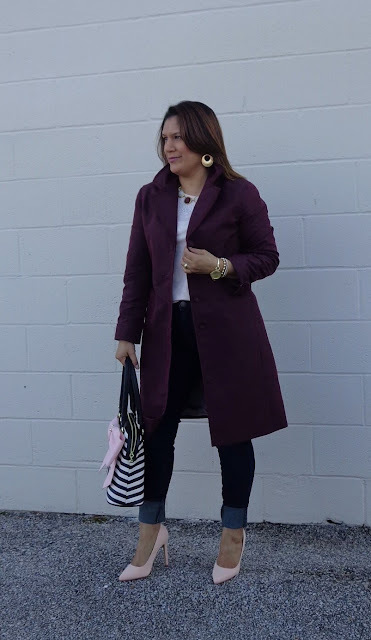 My most recent coat finds have been at JcPenney and resale shop called Uptown Cheapskate! 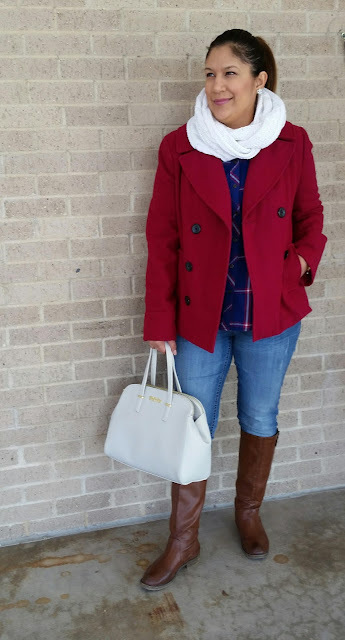 This Merona coat from Target I bought at Uptown Cheapskate for just $12!We also have a DD's Discount store which is like a Ross and that is where I have found most of my Betsey Johnson and Kenneth Cole Reaction handbags! This one is an off white bag retails $98 and I bought it for $29!Today was a perfect day to wear the coat with a scarf, riding boots, and a plaid shirt! This week I had two deal finds, this Betsey Johnson striped and bow handbag for just $29.99! And this cute plum rain coat at my local Uptown Cheapskate resale shop for just $12!So I color contrasted the plum with a soft pink Elle tee from Kohls and soft pink pumps! Fashion for less, that's my kind 9f style!TGIF loves! As the weather here in Texas slowly starts to warm up, I can't help but get those skater skirts out! But still keeping the Fall/Winter style adding a turtle neck and blazer! I found my turtle neck at JcPenney over the holidays for under $10! The blazer I've had for a few years! 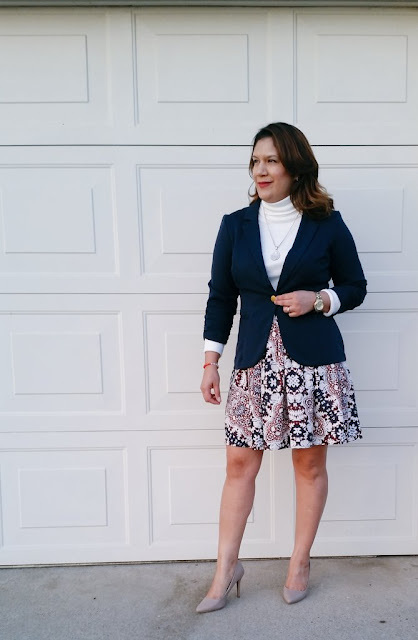 And the printed skater skirt was a recent clearance purchase at my local TJMaxx for just $10!If you still have very cold weather, add some tights and booties for a warmer look! When you have a last minute dinner date with friends and you have to choose an outfit, always go for a casual yet chic look! It never fails! Perfect for a bar and grill or semi formal place! 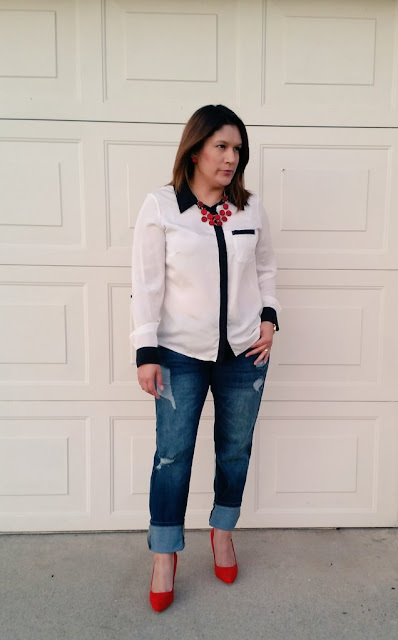 Pumps always make jeans look dressed up!My blouse is from Cato Fashions (old purchase)! My jeans were $11.99 at Image at my local mall and my red pumps were $21.99 at my local Forever21.The accessories were ea $5.99 at my local Icing store. This outfit was easy to put together and not time consuming at all! This year there were so many great looks on the red carpet at the 2016 Golden Globes! But I had three absolutely favorite looks of the night! Jennifer Lopez opted out of the usual sheer or cut out dresses for a Giambatti Stavalli caped mustard gown with silver accessories and matching lip and nail color! Jaimie Alexander rocked in a emerald green and black gown by Genny with a low plunging neck line! Her hair, makeup, and accessories were on point! Jenna Dewan Tatum looked beautiful in a shimmery navy Zuhair Murad gown. Her dress also had a low plunging neck line! And with pockets, I loved even more! As we wind down the week, I finish Friday with this MNG printed tee which I bought last year at JcPenney! Before the Christmas holidays I found these Ana Jeans also at JcPenney on sale! 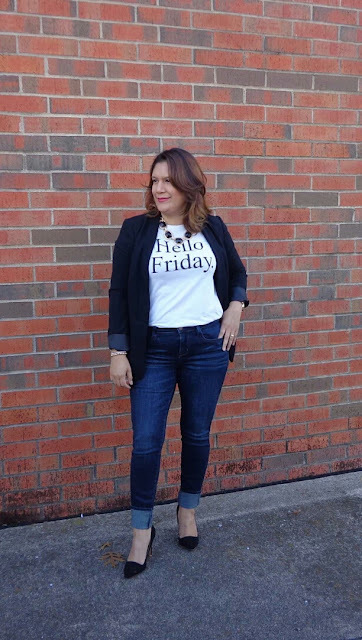 The Lauren Conrad blazer is an old purchase and my Forever21 pumps were a resale shop find for just $8!Casual Friday with a twist of chic to street style!